Panama’s Bocas del Toro province, part-mainland and part-archipelago, may well be one of the best-kept secrets in the Caribbean. Upon landing here, you will experience ocean breezes, soft reggae music, stunning scenery, and a laidback atmosphere. Views are quintessential Caribbean—white-sand beaches, perky green palms, and warm crystal-clear water. Typical visitors range from backpackers and surfers to wealthy adventurers who enjoy traveling to off-the-radar locations. The provincial capital, Bocas Town, on Isla Colón island, is named after Christopher Columbus. The explorer landed not far north of here, in present-day Costa Rica during his final voyage to the New World. Over 100 islands form the Bocas del Toro archipelago, many of them uninhabited or under the autonomous rule of the Ngäbe-Buglé tribes, and thus off-limits to foreign ownership. But, a thriving expat community exists on the main island of Isla Colon, and to a lesser extent on nearby Carenero and Bastimentos islands. In Panama, Bocas is about as far as you can get from Panama City, around 300 miles northwest. To get to Bocas Del Toro you can drive about seven hours from Panama City to the town of Almirante, where you can then take a half-hour ferry or water-taxi to Bocas Town. Alternatively, you can fly about an hour from Panama City’s Albrook airport. Bocas has a unique cultural diversity. The Ngäbe-Buglé make their home here, governing a vast reserve on the mainland as well as the archipelago. The people of Bocas town, however, are primarily of African descent. Some of their ancestors hailed from other parts of the Caribbean like Jamaica and Barbados, while others are descended from African slaves brought here by colonizers. At first blush Isla Colón may not seem impressive. The airport and docks have a shabby air. And if it’s raining—a frequent occurrence in these parts—you won’t realize what a vivid blue the ocean is. But don’t let this fool you. Bocas has grown a great deal over the past 10 years. The main street is now lined with small hotels, dockside bars, and eateries. New recycling programs, and water catchment systems are making the island greener and a new, progressive initiative has banned single-use plastic bags for most retail. Though Isla Colón still has that small-island feel, there’s no doubt that tourism is up and the international community has grown. Expats living here tend to be very involved in island life. Some have started businesses, helping fuel the island economy, others enjoy teaching local students, and others find time to volunteer for important causes or charities. Much good has come of this growth, and the community has worked to protect the flora and fauna, and local marine life such as sea turtles. 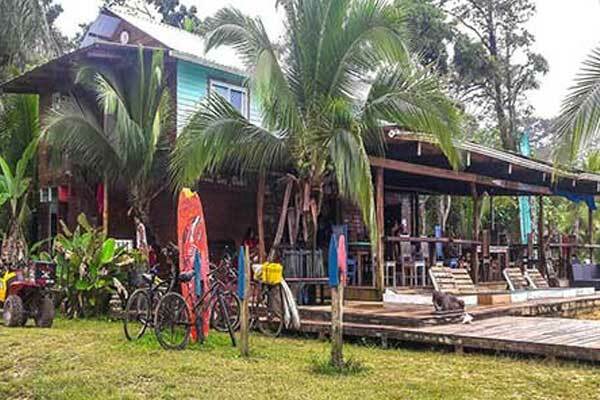 Bocas Del Toro is also a perfect place to test drive your dream Caribbean lifestyle. The expat community is welcoming, it’s organized, and it gives back. A few days is all you need to start networking and making friends. Expats David and Alli Emerson, owners of a small B&B called Surf Break @ Paunch, moved here in November 2015. Their part of the island, known as Paunch, is removed from the airport and hubbub of the town center. Panama was nowhere on their radar until they caught some travel footage on television. They liked Bocas Town because it was a small town, not over-developed with franchises and big resorts. This area of the Caribbean does however get double the rainfall of the Pacific coast, around 120 inches a year. Bocas Town has a public hospital, offering inexpensive basic care such as x-rays, lab work, and minor dental work. But, for anything major, you would need to travel by boat or air to the city of David or to Panama City. A large amount of Caribbean coastal land is difficult or impossible to buy or build on. Reserve areas and national parks are off limits and a lot of the land you’ll see advertised for sale is untitled or Right of Possession (ROP). For this reason, we recommend long-term renting in Bocas. The Pan-American Highway which spans the isthmus of Panama, parallels the Pacific, where there’s a lot more development. That in turn translates to better infrastructure—better roads, better power, better Internet connections. With a much lower cost of living than better-known hotspots like the Bahamas, completely outside the hurricane belt, and just a one-hour flight from cosmopolitan Panama City. Right now Isla Colon is a fantastic place to rent. The fact that the amount of smaller homes for rent has soared, means you can take your pick. One fully-furnished condo is on offer for $600 a month and includes WiFi and water, air-conditioning is extra. Of course, there are some grander apartments and homes on offer in Bocas, as well. A two-bedroom, two-bathroom apartment in a quiet area with shared access to a large garden and terrace with air conditioning is available for $1,100 a month, while the same apartment without air-conditioning is available for $950 a month. Depending on the lifestyle expats choose, a couple can live here on as little as $16,800 a year, or $1,400 a month, renting a simple, snug, island-style home. 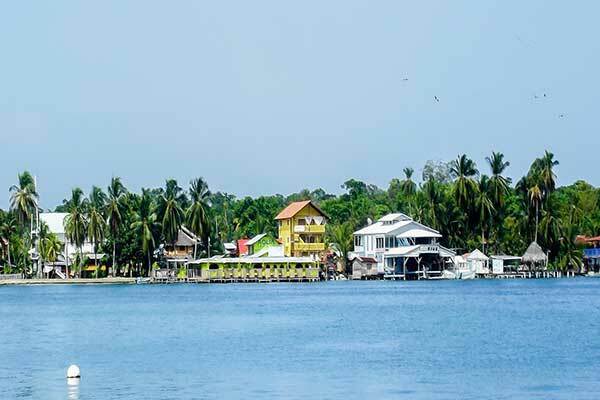 You have choices in Bocas, whether you want to be in the busiest part of town, near the airport or water taxi marinas, or in the quieter areas that make up the bulk of the island. Tourists are visiting in increasing numbers and English is widely spoken. There are expats of all ages, both working and retired…and the opportunities to socialize and have fun are endless. When my husband, Doug, and I decided to spend seven weeks in Dolphin Bay, part of the Bocas del Toro archipelago, in the north-west corner of Panama, we were not sure what this adventure would bring…Other travelers had told us that it rained a lot and that we would find grocery shopping very sparse. We were delighted to realize that these stories were mostly inaccurate. We were pleasantly surprised. The sun has been shining for us almost every day and we eat plenty of delicious food. Fresh tropical fruits every day, yogurt and granola in the morning, fresh green salads, local fish and seafood, and much more. We are feasting on many different kinds of bananas and making our own juice from abundant lemons and oranges from the land. To keep healthy, we sip fresh coconut water. Food shopping is easy enough and the choices are plentiful. The prices are comparable to the rest of Panama. For about $100 a week, you will get a lot of variety. The small markets in town have all the basics; the two fish markets have plenty of seafood and the deli has lots of European treats and “gringo” type foods. What else could you wish for? Maybe a Costco for all your staples and big items? No problem! For a small fee, about 5% of your spending, a local lady will go shop for you in the larger town of David and bring all the weekly orders back to be picked up right here in Bocas town. 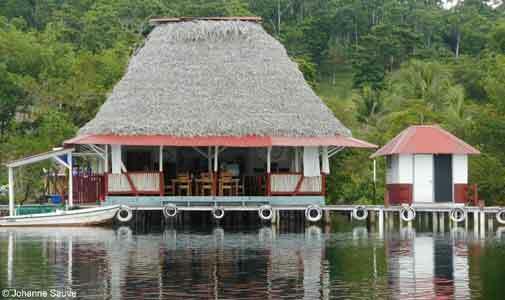 Throughout the Bocas archipelago we have discovered tiny floating restaurants and bars only accessible by boat. Navigation here can be a bit of a challenge because there are so many uninhabited mangrove islands and you are at the mercy of the weather. However, it’s part of the fun of living off grid, where there are no roads to depend on. One of Bocas del Toro’s boat-accessible restaurants. We have the pleasure of living on a beautiful organic cocoa farm in Dolphin Bay, surrounded by nature at its best. We have never experienced such a peaceful and quiet environment. Last night, we marveled at a most spectacular sky. An infinite number of stars shimmered across a moonless canvas. The community of expats here in Dolphin Bay is a very interesting bunch. They are friendly, welcoming, but they also relish their privacy. They value the simple, quiet life without having to depend on city services. Solar panels provide the energy, rain catchment systems deliver the drinking water, and small boats are the transit system. Many of these adventurers arrived by boat. They sailed here from all over the world, maybe on their way to somewhere else, and ended up dropping anchor in Bocas and calling it home. They have fascinating backgrounds and astonishing stories to share. They brought with them a special spirit that binds them together in their new home. Every week, I join a small group of women playing dominos. Doug and I participate in local community projects, and we look forward to simply sharing Sunday morning brunch at a popular floating restaurant. There are abundant daytime activities but when the sun goes down, it’s time to head home and get tucked in for a long, restful night. Like us, you can sojourn here if you are a bit of an adventurous soul and have good boating skills. My husband and I are having an experience to remember for a lifetime. This secret haven, known as Bocas del Toro, awaits your discovery.